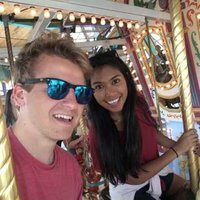 Young couple on the adventure of a lifetime! We are Mark and Tasmeen (Taz for short), a 30 and 28 year old couple who have recently taken a break away from work, bought a fantastic camper van, and embarked on a journey around the world. I am originally from Edmonton, Canada and Taz is from London, UK. We are making our way down the west coast from Canada in our determined 1978 Dodge Vanguard (Class B) and are looking to meet new people, share stories, and, by doing so, see America! Prefer lake or riverside if out of town, of course! Or high up and out of sight. We are from London, UK on a year of travels so don't have anywhere to put others up unfortunately! But when I do buy/rent my next home, sharing and saying thank you will be a priority. 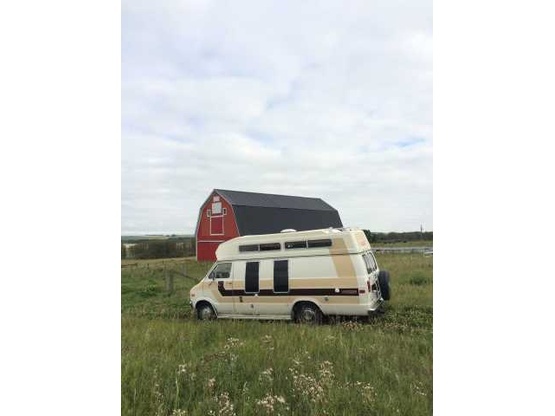 1978 Dodge B300 Vanguard campervan. 9 feet tall. 18'8" long. Class B. No slide-outs. 1970s beige! MarkandTas left my place this morning. They only stayed for one night and would have liked to have had more time to get to know them. Would have them back anytime, and wish them all the best. Thanks for stopping by. We had a great time hosting Mark & Tas, had great conversations & fun sight seeing with them. Quiet and respectful. A joy to host. Will gladly host them again. We really enjoyed the few days MarkandTas spent in our driveway. They are truly joyful in their approach to life and each other... very refreshing. We hope your continued journey affords you more opportunities to affect others with your brand of happy. Thank you for being here with us. MarkandTas were real friendly guests & very pleasant. We would recommend them to any host location. These guys were nice, polite, quiet and no trouble at all, and we fully recommend them to others! (and great to hear the ‘Saff Larrrdon’ accent again Taz! :-) We can fully empathize with their ‘carrying out the dream’ of touring the west of USA while they have the chance, something we wish we’d done decades earlier, and we wish them well as they continue! The Boondockers Welcome principal is a great one and we were happy to act as hosts for guys like these (after all we’ll be ‘guesting’ like them ourselves soon, and hopefully what goes around comes around…) Best Regards from north CA. Mark and Tas were easy guests. Their rig fit nicely in our driveway, they are friendly and relaxed. they communicated well and were nearly silent while staying. We'd host them again any time! Safe travels you two!